Acer laptops are a stylish and affordable solution to your computing needs. They’re ideal for use at home or work, and thanks to their long battery life, they won’t let you down when you’re on the go or away from your desk. 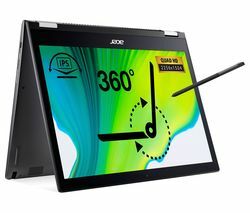 Acer is one of the leading laptop manufacturers and it’s not hard to see why. They make affordable laptops that are jam packed with features. And there are plenty to choose from too, from the pink Aspire V3-112P 11.6"" Touchscreen model to the more business-focused Aspire V3-574 15.6". With such a broad range, you’re bound to find an Acer laptop that’s right for you. All Acer laptops come with Windows installed and ready to go, so you’ll be able to use it straight away. The Acer Aspire E5-573 15.6" Laptop features Intel® Core™ processing, 8GB of memory, a huge 1TB hard drive and up to 5 hours battery life. Whether you’re looking for your next gaming machine or a laptop that can use when you’re working from home, you’ll find an Acer laptop that’s perfectly suited to your needs. The Acer Aspire ES1-512 15.6" is a popular model as it’s affordable yet powerful and has up to 7 hours battery life. Check out some of our other great laptops from brands such as Asus and Toshiba.